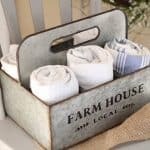 As I’ve been slowly transforming our 1980’s fixer upper, I’ve stumbled across lots of beautiful farmhouse accents online. I like to add in farmhouse decor where I can to update a space without requiring the budget needed for larger updates. For instance, maybe you don’t have the budget or know-how to manage a full bathroom remodel right now, but you could try updating an old towel rack with the pretty doorknob hooks seen above. All for less than $30. Or maybe you wish you could gut your whole kitchen. 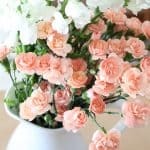 But, perhaps in the meantime you could try filling a gorgeous porcelain pitcher (see above) with fresh flowers to brighten your space and add a bit of farmhouse charm. 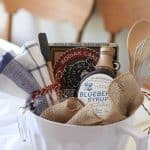 Any of these “finds under $30” would also make an adorable gift for the farmhouse fan in your life. For instance, wedding season is on the horizon and I could imagine the batter bowl (above) being a cute bridal shower gift (like this) paired with some baking utensils and a recipe. Lots of options here! Please note: The list below contains affiliate links which allow me to earn a small commission when they are used. Read my full disclosure here. 1. Acacia Paddle Board (Target) | I am definitely waiting for this piece to go on sale (it’s currently $19.99, but we like sales around here! ), it’s the just the thing for appetizers or a cheese plate. There are no reviews yet on this though, just as a heads up! 2. Galvanized Envelope Mail Holder (Target) | I think this would be really cute mixed into a gallery wall with some family photos or something similar tucked in. 3. Chicken Wire Wall Basket (Hobby Lobby) | Love this. It’s on sale for $5.99, so a very inexpensive option to spruce up a blank wall in your home. 4. Wooden Drawer (Hobby Lobby) | These drawers have that “found” look to them without the challenge of actually finding them, ha! With the increased interest in antiques these days, sometimes it’s nice to skip the hunt and just pick up something that merely looks old. 5. Door knob/wall hooks (Amazon) | Wow, are these ever cute. Watch the price on these though as I see it go up and down quite substantially. Sadly they are currently out of stock (updated Aug 2017) so I hope they come back! 6. Soap and Water Sign (Amazon) | Adorable little sign with great reviews. 7. Food Storage Canister (Target) | This is such a fun piece. It’s just barely under $30, so maybe watch for a sale? 8. Pewter Table Clock (Amazon) | Oh I do love clocks. This is a great piece to add a subtle pop of color on a nightstand or end table. 9. Porcelain Pitcher (Target) | My sister owns one of these and it’s gorgeous. Definitely looks more expensive than $13.99. Fill with fresh blooms or faux and it’s a lovely accent piece. 10. Wall Decor Scroll (Hobby Lobby) | A cute piece for a gallery wall. 11. Tea Canister (Amazon) | I think this could be a fun gift to someone who loves tea and farmhouse decor. 12. Utensil Holder (Crate and Barrel) | Farmhouse perfection. Clean, white, simple. 13. Batter Bowl (Crate and Barrel) | Excuse me while I go whip up some pancakes, because this bowl is too CUTE to not! 14. Pioneer Woman – Lace Serving Bowl (Walmart) | A serving bowl with a bit more femininity.